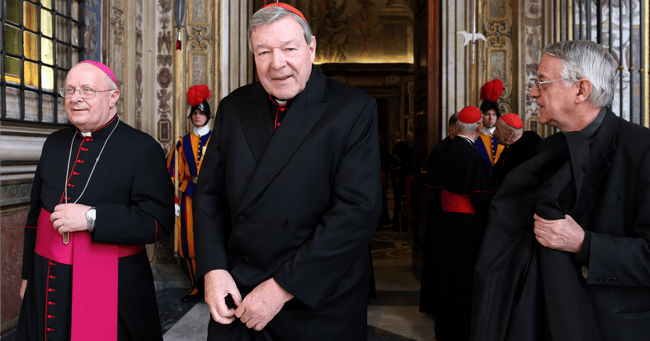 The Vatican is unlikely to respond to George Pell child abuse allegations. George Pell: Vatican unlikely to respond to child abuse allegations until police investigation complete, expert says. The Vatican is not likely to respond to child abuse allegations against Cardinal George Pell until the outcome of police investigations, according to a Vatican expert. “The Vatican will want to wait and see how any investigation proceeds,” Christopher Lamb, correspondent for Catholic journal The Tablet, told Lateline. Mr Lamb, currently in Krakov, Poland to cover World Youth Day, said the allegations against Cardinal Pellhad “certainly been on the radar here”. “I know that people will be monitoring it, be looking at it,” he said. Mr Lamb said when a credible accusation of abuse was made against a priest or bishop, the norm was for them to step down while the issue was investigated. But he said it would “be very difficult for the Cardinal to do that in this case because he’s got this job in the Vatican reforming the finances and it’s a difficult, complicated role”. Cardinal Pell was an influential figure in the Vatican, he said. “The Pope called Cardinal Pell to Rome after he was elected as Pope to help him reform the finances in the Vatican, and that’s an incredibly important job. It’s the centrepiece of what the Pope is trying to do in making the Church more accountable,” Mr Lamb said. “Cardinal Pell has been working very hard and has actually made progress in getting some reforms of Vatican finances underway. So his role is influential and Cardinal Pell has been a big player in the global Catholic Church for many years. Cardinal Pell has emphatically denied the allegations. “In the short term I think the Vatican will accept that and wait to see how any legal process progresses,” Mr Lamb said.